The fallout from Saturday’s All Aged Stakes is set to dominate headlines this week, ensuring racing remains on the front pages of the Sydney newspapers beyond the conclusion of the autumn carnival. It promised to be the race of the carnival and it didn’t disappoint, although it will long be remembered for the post-race theatrics of John Singleton and Gai Waterhouse rather than the racetrack performance of All Too Hard. The antics of All Too Hard would normally have made the headlines. Now that Black Caviar is off to the breeding barn, he represents the closest link to her. And even though he’ll also be gone come August, he still attracts publicity, somewhat due to his ability but mostly due to his pedigree. That’s not to say he’s short of talent, though. He looked no chance up the Randwick rise on Saturday and it looked as though his Sydney hoodoo would continue, but he stretched out in the manner of a top liner to grab a gallant Rain Affair. It was electric. Nevertheless, it shouldn’t come as any surprise that two of racing’s biggest egos, two of racing’s shrewdest minds and two of the most publicity-conscious personalities managed to steal the headlines on the final day of the Sydney Carnival. Gai Waterhouse vs John Singleton. Hell, the Waterhouse family vs Singo. Forget the debates which will inevitably occur come the September federal election, it would be a promoter’s dream to see them clash verbally. What a stoush! It has all the aspects of a Victorian melodrama, with tales of corruption, deception, anguish and greed. At its core is a saucy triangle, with the damsel (if you objectify Gai Waterhouse in such a manner) forced to choose between two warring men. Maybe that’s taking it slightly too far, given two of the parties are mother and son. But it shapes up as a melodrama of the highest order, a story which even the most creative Hollywood scriptwriters would find too fanciful. What has been overlooked by all – particularly by an owner who believes his horse is almost invincible – is that More Joyous simply wasn’t good enough on the day. This is pivotal to Friday’s stewards inquiry, for the point of the hearing was to establish why More Joyous had run below market expectations. It’s easy to gloat after the race, but I was convinced More Joyous could not win Saturday’s All Aged Stakes as early as Thursday. In my role as a bookmaker for Luxbet, I represent the racing staff in a weekly segment for Racenet called ‘Tips from the big bookies’ in which I give our best of the day, value of the day, lay of the day and best backed runner. After hours of doing the form for Saturday’s races, I came to the conclusion More Joyous had to be the lay of the day. When we submitted our tips on Friday morning, she was the horse we were happy to risk. “There’s no doubt she was unlucky last start, but this is a tougher race again and I’m not sure she deserves favouritism over the two three year olds. She doesn’t look the powerhouse she once was,” I wrote. On Saturday morning, I took it a step further by leaving her out of my top four selections. I chose to stick with the three year olds, putting Epaulette on top after his fine second to Black Caviar. He finished sixth, a length in front of More Joyous, so I was wide of the mark there. My next three selections were All Too Hard, Rain Affair and Fiorente, who ran first, second and third. For readers of my blog, the decision to leave More Joyous out of my numbers provoked outrage. In fact, that one exclusion resulted in more feedback through Twitter, Facebook and emails than any other post this year. 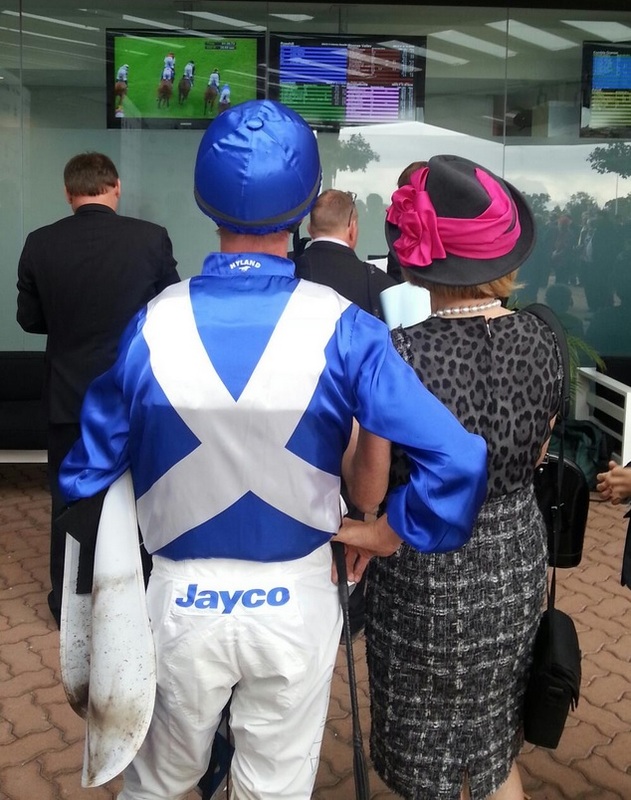 “You know More Joyous is running in Race 7 in Sydney, right? Just checking,” one punter wrote. “You seemed to have missed More Joyous,” asserted another. Over the hours, the comments became more cynical, a confidence now oozing from those who queried me. “I cannot see how she possibly misses a place, she’d have to lose a leg,” said one Facebook comment. “Remind me never to follow your tips at the races again if you can’t find a spot for More Joyous,” wrote a Twitter follower. Post race, I had a number of phone calls from mates wondering if I’d received the Tom Waterhouse mail. I even received one accusatory email from a mate who wanted to know why I didn’t let him in on the good mail I’d received. The truth is, I knew nothing. I don’t know Tom Waterhouse and even if there was a whisper around, I wouldn’t listen to it. I’m confident enough to form my own opinions. I knew More Joyous had worked well on Thursday morning but I didn’t know she had any problems after that gallop. In fact, like most punters, I was only aware there was an issue when John Singleton brought it up in a pre-race interview on Saturday. For me, there were a number of reasons I wasn’t convinced she would figure in the All Aged Stakes, points which have been ignored by journalists wanting to paint More Joyous as the victim of a vicious plot. Firstly, I didn’t think she was at her best in the first place. And I don’t think she’s been at her best since she laboured home in the Toorak Handicap last October, in what was a gutbusting effort. If she’d been at the peak we’d seen in past seasons, she would have given Pierro a race in the Canterbury Stakes. She still ran well first up, but the More Joyous of old would have fought on tenaciously. By her standards, it was just a run. Even last start, there were signs she wasn’t the same More Joyous that had toyed with fields like this in the past. She was unlucky and with even luck she would have won. But I’m not sure she would have put a space on them like she would have a season or two ago, given the acceleration she showed once she got clear running. The circumstances of that race were another reason to be wary. I never like backing horses the start after they’ve been involved in buffeting like that. Not only does it fail to give a true sense for how a horse is going, but it can affect a horse’s mental state. Confidence is a major element in racing, and an incident like that which faced More Joyous in the Queen of the Turf can affect a horse’s confidence severely. A mare like More Joyous is different to the rest. She’s tenacious, she’s been to war many times before. It’s unlikely the interference would have affected her too badly. But it’s always possible. Many times, I’ve thrown one in the blackbook only to see it struggle next start. I wasn’t about to do the same with More Joyous at such a short quote. Value is everything in my eyes when assessing a race. In itself, a pressing reason to take her on was simply the fact she represented no value, something which played out one the market late. Dominic Beirne, Australia’s most respected form analyst, highlighted this point. He said she was a genuine $4 chance, when many were happy to back her at a $2.50 quote. She eventually got out to $3.80 in the Sydney ring, although the call was shorter. That was closer to her right price. Rain Affair, who was always going to be suited with the lack of genuine speedsters besides him, looked value. Fiorente, who had never raced over less than 2000m but had flown at trackwork with blinkers applied, looked value. More Joyous did not. As a result, she was easy to oppose. Another factor which played heavily on my mind was her unusual trait of failing to win the races for which she is set. In fact, the only time she’s won her ‘grand final’ was in last year’s Doncaster Mile. Granted, nearly every other time, there have been genuine excuses. She struck a heavy track, which she doesn’t handle, in the Golden Slipper and at her first Doncaster Mile attempt. She probably hasn’t coped with a tough 2040m or Moonee Valley at her two Cox Plate attempts. Injury brought an end to both her three year old campaigns before she could reach her grand finals. Nevertheless, when taken together, it doesn’t make for pretty reading. The All Aged Stakes was her grand final this preparation. Brisbane was an option but was considered unlikely, while retirement was mooted as a possibility. With all the other factors taken into account, it became clear she had plenty against her as she lined up in the All Aged Stakes. I became more confident after seeing her parade. Her coat didn’t have the shine it tends to have when she’s at her peak. She looked rather plain, quite lacklustre, never a good sign. Around the turn, though, I’d given up hope – I thought she was going to win comfortably. But suddenly, she punctured, and All Too Hard swooped to take his first Sydney Group 1. Perhaps the setback – which I’m sure will attract attention at Friday’s inquiry – did affect her, but even without the setback, I still believe she would have struggled to win on Saturday. It’s something to ponder ahead of the most anticipated stewards inquiry in recent memory. Didn’t write it to glorify myself at all. Just to prove that there were reasons why she didn’t win, other than just a simple injury. She wasn’t out of her depth, when did I say that? I said she’s not the same horse she once was. Fair point. Hindsight is a wonderful, wonderful thing. Journalists patting themselves on the back should be avoided at all costs. Making yourself the story is not real journalism. Try again. I’m sure this wont see the light of day. You cannot handle any accurate or real world criticism. Your lack of honesty and limited vocab will get you nowhere. Cheers for your comment. I’ve already noted it was too conceited an article. Don’t see how I’m dishonest, but whatever.